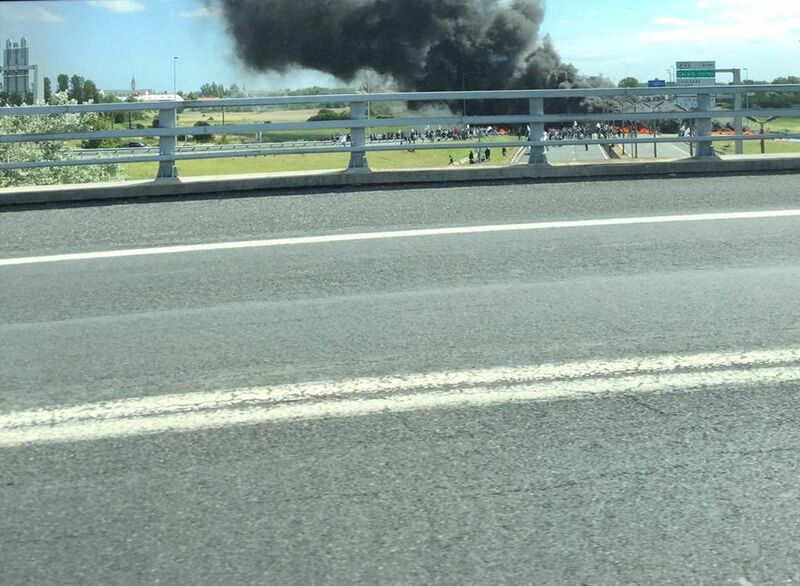 Major disruption from various strikes in France, all affecting drivers in one way or another. France is awash with strikes at the moment, especially in the north. By our reckoning there are four different disputes, all of which hit drivers and tourists one way or another. In a rare bit of good news, the former-MyFerryLink workers finally agreed to let DFDS back into Calais today. However, the strikers immediately went to the A16 motorway outside Eurotunnel and blocked exits and entrances with piles of burning tyres. Eurotunnel quickly advised day-trip passengers to postpone journeys for another day but an early diversion into the terminal off the A16 eastbound, from Boulogne, was soon closed too. Fortunately the blockade was lifted at around one o’clock local time. After repairs to the carriageway, access to the terminal was restored soon after though passengers face inevitable catch-up delays for the rest of the day. Meanwhile, farmers angry at the low prices paid by supermarkets continue their blockade on the N814 Caen ring road for a second day. Other road blocks have been set up on the road into Mont Saint Michel, the A84 northbound into Avranches, access roads to Evreux, on the A29 Pont de Normandie and A171 Pont de Tancarville bridges between Le Havre and Rouen, the D137 into St Malo and latterly the A29 at Amiens (see above for the current list, or this map made at 18:30BST). President Hollande announced an ’emergency plan’ today to address farmers’ concerns. That brings some hope of relief in Normandy though if anything the blockades have increased since. In this context the relatively small scale march to disrupt the Tour de France rest day in Gap today – by locals upset over the continued closure of the Chambon Tunnel on the vital Gap-Briancon road – seems trivial. Finally, French hauliers upset with the MyFerryLink strike in Calais say they will hold their own protest. It remains to be seen whether it will go ahead now DFDS is back in the port. Otherwise, be prepared for traffic disruption in Arras – at the junction of the A1 and A26 motorways – from 10:30 tomorrow (Wednesday) morning. Update: thankfully, according to La Voix Calais, the truckers have now called off their Arras go-slow.